I got my personal ipsy reveal, and February is a lovely month. As I’ve done in previous months, I’d like to go over predictions for my items. GLAMGLOW BRIGHTMUD Eye Treatment – full size $69.00; ipsy sample $11.50. I haven’t tried any GLAMGLOW products, but I hear such good things about the brand. My under eye area is a major concern, so I definitely want to give this treatment a shot. What I’d really like to do is get some before and after pictures to share when I do my bag review. It’s a relief to get samples of this product, because, as always, the full-size is a big investment for something that may or may not work. I fell in love with the peel mask from January’s bag (it’s available for this month’s bag too), so I could see paying retail price for the full product. There is certainly work to be done on my eyes, so I thin ipsy nailed it with this one. If I see the 3-minute results they’re advertising, this might be my 5-star winner. If not, at least I got to try it out without forking over $69.00. 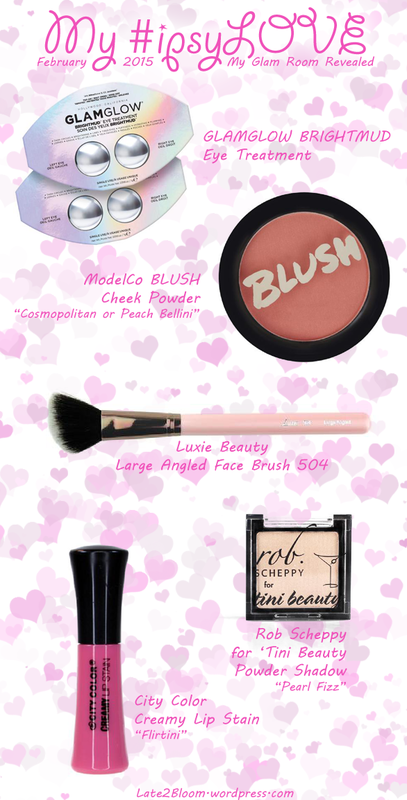 ModelCo BLUSH Cheek Powder (colors: Cosmopolitan, or Peach Bellini) full-size $22.00; ipsy size 0.12oz $9.43. Every bag contains the blush sample this month. That’s great, because I need a good blush. I feel like I’m always too timid about purchasing this sort of product, because I don’t want a big pink swatch across my face, but that has never happened. As long as I don’t look like a clown, this is probably a 4 out of 5. Luxie Beauty Large Angled Face Brush 504 (synthetic bristles 100% vegan) $16.00. Hells to the yes I’m getting a brush. This is a fairly pricey brush too. Before the Glam Room reveal, I hadn’t heard of this brand, and the only thing I could find that looked close to this was from Sedona Lace (check them out too, they have some gorgeous brush sets). Texture will tell whether it’s right for the intended purpose. I reserve the right to fall in love, but I’m not giving it my 5 yet. I’ll say 4 out of 5 until I see it’s not just another brush I could have picked up anywhere. Rob Scheppy for ‘Tini Beauty Powder Shadow (color: Pearl Fizz) $12.00. Full-size! But, ipsy, why? It’s not really your fault. Even though I changed my quiz results for a more dramatic look, every reference you find online says peachy neutrals are the perfect match for grey eyes. Let’s take a look at all the bags I’ve received since I subscribed: Be a Bombshell Eye Base (submissive), Pixi by Petra Fairy Dust (brightening bare), Pacifica coconut mineral eyeshadow (Ethereal). It’s okay, really, because I was just going to hide it behind glasses anyway, but you could have saved $2 by sending me one of your two perfumes this month instead, right? I’m not expecting to be blown away by this shadow. It’s presented as a highlight, which might score it some points if it’s got enough pop. Otherwise, probably a 3 out of 5. City Color Creamy Lip Stain (color: Flirtini) $4.99 I’m not expecting to be surprised by a pink lip stain, but it is full-size and it is a great color for the pink look I love this year. This one is going to be a 3 out of 5 crossing all necessary digits to become a 4 or 5. Please be the answer. If this isn’t my highest scoring bag, there is something seriously wrong. I’m saving nearly $44 off retail; more if you consider products that are only available for purchase in full-size. I did tweak my quiz results in January, but I feel certain I would have received this set regardless of the changes. I’m a little disappointed in the eyeshadow. I love eyeshadow, but I’ve got so much in their go-to color that I could go full blown ganguro when summer rolls around. What my heart truly desires is perfume. I have wanted to get my hands on some Demeter for a long time, and it’s not that I can’t afford it, it’s that I can’t decide. I’m addicted to olfactory experiences, and they have so many amazingly specific scents I fear I’ll be passing up something even better if I pick just one. Perhaps I should give Scentbird a try? I can’t wait to get my first Ipsy bag this month. I’m excited about the blush, cause I’m just like you -timid about buying it.